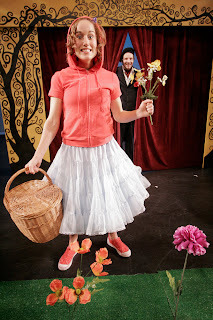 This farcical spoof of Little Red Riding Hood is a grownup production that works well for kids, largely because of its hilariously over-the top performances. Erin McGrath, last seen at Manitoba Theatre for Young People, turns in a delightful performances as the impish, if not obnoxious, Little Red. Gotta love her Edith Piaf imitation. Not outdone is Rob McLaughlin as the villainous wolf, employing a Maurice Chevalier accent and hamming it up even more than he did as Bottom this spring in A Midsummer Night's Dream. The gimmick here is provided by American playwright Joan Shenkar, whose script calls for stage directions to be read out loud by a narrator, Tricia Cooper, doing double duty as the grandmother, a wine-loving butcher. The highly ironic 60 minutes call to mind the shenanigans of the old Rocky and Bullwinkle cartoon show. Nothing up their sleeve but talent. Once upon a time there was an alcoholic butcher grandmother, a French-accented wolf with a serious saliva problem and a little, red, riding-hooded girl who wrings the necks of wee little songbirdies in the deep dark forest. No, this isn't your childhood fairy tale, boys and girls, but who needs happily ever after when you've got all the makings of a deliciously dark Fringe hit? Local company No Sugar Added Productions' Universal Wolf is just that, taking an innocent storybook tale and corrupting it with bloody murder and grisly humour. As a bittersweet Red, Fringe first-timer Erin McGrath lisps her way into the bad books of her blackberry wine-guzzling grandma -- played by hilarious Royal Liechtensteiner Tricia Cooper - while charming, moustachioed Big Bad Wolf Rob McLaughlin sharpens his teeth for what he hopes will be his happy ending. Not in this version, wolfman. A huge, no-holding back tip of the hat to the cast of this comedy-musical for their huge, no-holding back performances. It’s Little Red Riding Hood, retold as it was originally intended, with lots of sharp teeth and no heroic woodsman. Tricia Cooper brings sly timing and delivery to her dual role as narrator and Grandma. As a pouting, lisping, Red Riding Hood, Erin McGrath is a wicked cross between Gumby and Shirley Temple’s evil twin. As the wolf, Rob McLaughlin delivers one of the this year’s most entertaining performances. Think of Pepe le Pew with fangs. Spinning from smarmy seducer to salivating carnivore, he wins this year’s “Most Pronounced Forehead Vein” award. The cast’s crazed glee makes it a fun parent-child pick. Tricia Cooper is thrilled to be appearing in The Universal Wolf . It’s not often she is encouraged to drink through the entire show and rehearsal process. These people are method! Tricia is part of Prairie Theatre Exchanges new Playwriting Unit and had two new works read at the Carol Shields festival last May.. She has also been a frequent contributor to Definitely not the Opera for CBC radio, writing comedic commentary. Tricia is also performing her solo show Homely Woman #2 at this years Winnipeg Fringe. Erin McGrath recently made her Manitoba debut in MTC’s production of The Real Thing, followed by MTYP’s The Skinny Lie. Other selected theatre credits include; Little Women, Cheatin’ Hearts (The Victoria Playhouse), Cowgirls (The Georgian Theatre Festival), Peter Pan (Theatre New Brunswick), The Mystery of Edwin Drood, and Les Belles Soeurs (The Annex Theatre). She can next be seen starring in the world premier of Still Desire You for Theatre Western Canada and Alberta Theatre Projects. Erin is a graduate of the Randolph Academy for the Performing Arts. Christopher recently moved to Winnipeg to take a position in the Department of Theatre and Film at the University of Winnipeg, for whom he has directed La La La Dispute and King Lear. He also just wrapped up a stint as text coach for Shakespeare in the Ruins’ production of Merchant of Venice. In his pre-Manitoban existence, Christopher was one of the founders of The Georgian Theatre Festival, where he directed The Play’s the Thing, Festival Follies: A Vaudeville Review, Marion Bridge, 1837:The Farmer’s Revolt, and As You Like It. Christopher was also the Artistic Director of The Vicious Gossip Group (Rumours of Our Death, Measure for Measure, Bonjour, La, Bonjour, Emma Zunz, The Power of the Dog). Christopher was a regular instructor and director for The Randolph Academy for the Performing Arts (Pippin, The Mystery of Edwin Drood, A Chorus Line and Into the Woods). He was also an instructor at York University. His production of Morris Panych’s The Story of a Sinking Man, starring Arne MacPherson, is also appearing in Venue #2. Suzie is an honours acting/directing student at the University of Winnipeg one year away from completing her degree. She has worked as an Assistant director for the Stratford Festival of Ontario's Shakespeare School and in October 2006 was asked by the University of Winnipeg Dept. of Mennonite Studies to produce, direct, and act in a production of her original work, Mi(s)placed, for their Conference "War And the Conscientious Objector: A History Conference." Suzie was last seen on stage as Mary Ann in George F Walker's Better Living. Look for her in U of W's upcoming 2007-2008 season.Suzie's is thrilled to be making her Fringe Festival debut this year as the Assistant Director and Stage Manager for both "The Universal Wolf" (No Sugar Added Productions) and "The Story of a Sinking Man" (Theatre Dirigible). is a 22 year-old freelance web developer, designer,consultant based in Winnipeg, Canada. Adam spends most of his daysstudying for his Computer Engineering degree at the University ofManitoba. Although he has a passion for everything web-related(particularly in the fields of design, standards, and usability) andspends his spare time using his Mac as an experimentational platformto explore and document this interest, among other things. He's a true perfectionist; sees everything as a potential photograph;has the recessive trait for tongue curling; can't do cartwheels; isproudly Canadian; and when very young, nearly drowned. Although lovesthe murky Manitoba waters now. He enjoys dismantling electronicdevices into as many pieces as possible to see how they work, themore expensive the better. Time is his biggest enemy. He can say thealphabet backwards in under 6 seconds, but reserves this uniquetalent for special occasions. He has a disturbing addiction toTetris. And he sometimes wonders why these paragraphs are written inthe third person.